The Master Lock dual-Function door security bar is the best door security bar for most people. Master Lock is known across the globe as the solid, dependable security brand and is world renown for some of their products like padlocks. Generations have grown up with products of Master Lock at home, work, and school. At present, a whole new generation was discovered with the latest and innovative security solutions for door security. As the biggest global marketer and manufacturer of padlocks, the company continues to design quality and value into its broad range of security products. Master Lock also entered the world of security, computer, and automotive markets. As security and safety gain important with the consumers around the world, Master Lock continues developing products that provide smart security solutions. Established in 1921, Master Lock continues to build upon its spirit of innovation, good value, and quality for the consumers. One of the products they boast is Master Lock 265DCCSEN, which is a dual function security bar designed for everyone who wants something that would help them protect their property from intruders. Whom Is This Master Lock Dual-Function Door Security Bar Designed for? 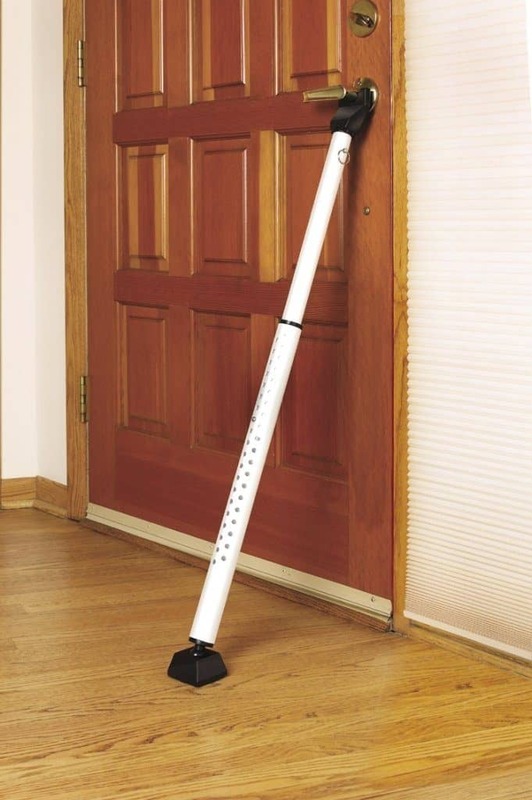 It is ideal for those who are looking for something that can help them prevent intruders. People who want a quality door security bar. Master Lock 265DCCSEN offers your home an extra dose of safety through reinforcing doors from the intruders. Designed with the world renowned durability of Master Lock, this security bar is crafted with twenty gauge steel to withstand over 350 lbs of force, helping anyone to ensure that the doors will remain shut securely. With an adjustable and versatile design, the Master Lock 265DCCSEN fits most sliding and hinged doors. Some of the features of Master Lock 265DCCSEN include a pivoting ball joint that ensures full contact with the floor, rugged twenty gauge steel construction, dual functionality, padded foot for sure grip, and so much more. Whether you use a security bar for hinged or sliding door, you can be assured that the design features of the bar are optimized to keep your family safe. For the hinged doors, Master Lock 265DCCSEN comes with a pivoting ball joint, which keeps it in full contact with the floor, giving a more secure and stable connection. The only thing you should do is to place the padded foot against the floor as well as wedge the specially designed beneath the door handle. 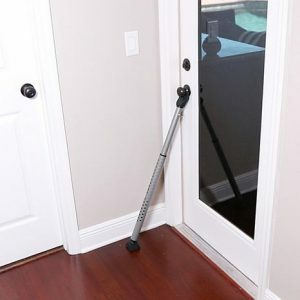 The foot will provide the security bar a tight grip against the floor and since the yoke and foot are padded, your door handle and floor will remain unmarred, even with daily use. To secure sliding doors, just turn the bar on its side, get rid of the yoke through pulling out the pin and adjusting the bar to the door’s length. When adjusted properly, Master Lock 265DCCSEN will make a firm seating between the jamb and door, which ensure that nobody can enter the door from the outside. It is also designed to fit majority of sliding doors. This Master Lock 265DCCSEN is made of thick, twenty gauge steel for strength. It is backed by the reputation of Master Lock for durability and security. Master Lock 265DCCSEN can withstand over 350 lbs of force. It also comes with a lifetime guarantee. If you don’t want to consider an effective security bar, Master Lock 265DCCSEN is never a bad choice. The reason behind it is that it works as it promise and will give you nothing but exceptional benefits. If you aren’t sure about purchasing Master Lock 265DCCSEN, there’s no need to worry about because this is backed by lifetime guarantee. This just means that it will last for many years and won’t let you disappointed. It is effective and available at a low price. It is portable and lightweight. In fact, you can bring this on trips. This security bar is versatile. 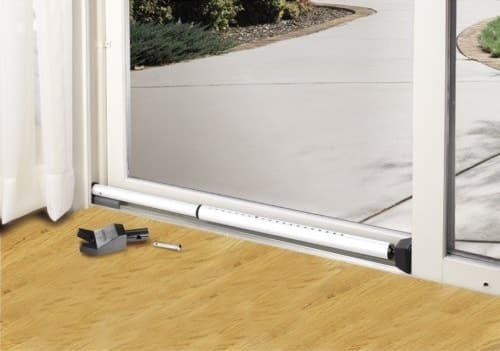 It is also adjustable and can be used on doors that swing inward as well as sliding doors. It will only slow down the potential intruders, either purchasing you extra time or alerting you. You may use this as a makeshift bat if you want to. It has good quality compared to similar competitors. Its effectiveness depends on how and where you place it. If you want to cover the whole areas, try positioning between seventy and eighty degrees once you install it behind the door. Its hook is designed with cheap plastic. It breaks easily. Another disadvantage of this system is its metal pop button lock, which could wear down and break depending on how frequently the device gets pressure. It is important to keep in mind that the bar works only with interior sliding doors and hinged doors opening to the inside. Master lock dual-Function door security bar has a yoke on top which is used against door knob and can be removed to fit sliding doors. The bar has adjustable length but the ideal angle to install the bar securely against doors is under 70-80 degrees. If you have double sliding doors you will require 2 bars. The bar can be installed at the bottom of the sliding doors, middle or top. If you would like to use the security bar as a child lock you can use it on sliding doors installed up away from the reach of children. The security bar won’t be efficient as a child lock on hinged doors, please be aware of that. The floor surface won’t get damaged using the security bar. It is compatible with carpet, but avoid rugs as it causes sliding. Other surfaces such as hard wooden floor or concrete are fine. However it is not recommended to use on sealed cork floor. The bar can be removed very easily in case of fire or emergency just kick the bottom of the bar away from the door. Question: Is it better than a 2×4 wood? Answer: It is a bit lightweight and could break easily. Question: Does it work if the outside door is the sliding door? Answer: No, it will not work. It should be the interior slider to work. Question: Can it be used on a carpeted floor? Answer: Definitely, just make sure to get the right angle of the bar correct so it can’t be forced upon. Question: Can it be removed quickly in case of fire? Answer: Yes, it locks users out not in. All you need is to pull the bottom and this will come right off of the doorknob. The Master Lock 265DCCSEN is known for its durability and versatile design. Although it does its job properly, see to it that you know how to use it correctly. If you aren’t used to it, you can always refer to a user manual. Master Lock 265DCCSEN is definitely a must have. If you are the type of person who wants to ensure that your property is safe all the time, this security bar may be of great help. It is engineered with features that are guaranteed to work and will give you a lifetime service. So, level up your security and don’t hesitate to get one by clicking here.